Internet orders will be processed or shipped as soon as possible, typically this means that they will ship the day you place your order. Packages will ship the next business day if placed after 2:00 pm Arizona time, or on weekend and holidays. Rarely, shipping will be delayed if Sea of Green, or the shipping distributors, are out of stock on an item. If this is the case we will contact you either by email or phone to let you know when that product can be shipped. We will also ask you at this time if you would like your order shipped partial, with the backordered item to follow, or if you would like the entire order shipped at the time all products are available. You will not incur additional shipping charges, unless otherwise noted to you. For speedier and many times a better shipping estimate call 1-844-663-0396 to place your order as a phone order. 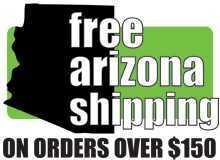 *Orders for more than $150 that are shipping to an Arizona address, may qualify for free fedex ground shipment. This does not include products that would normally have to ship on a pallet such as, soils, soilless mediums, air conditioners, some carbon filters, trays, and anything else that would normally incur extra shipping cost. However, larger orders that qualify for shipping that are shipped on a pallet because of the number of items will qualify for free shipping. At times, we will drop ship part or all of your order from the manufacturer/distributor. This is very convenient to customers on the east coast as it will ship in there general area as opposed to Arizona getting it there faster. Items that we list on our website may not always be available in stores, we offer items online as a service to our customers, as we work closely with many vendors and have access to many items, even though we may not generally stock them. NOTE: Shipping cost are calculated by package weight and distance traveled from our postal code in Tempe, Arizona. You may call us at 1-844-663-0396 to find out if we can get a cheaper shipping price by doing a drop ship from your area. Occasionally products ordered online may have a wrong estimated shipping amount (especially outside of the continental United States), gone up in price, or an error in the shipper's algorithm. When any of these things occur, we reserve the right to place your order on hold, if cost discrepancies need to be addressed. If this happens we will be glad to work with you on the cheapest/best way to get you the product (comping your shipping cost, free product, etc), and if we cannot meet your satisfaction a full refund will be issued. Our preferred shipping company is Fedex, but we will certainly use another carrier if you request it. We do charge $7.50 for USPS request. Post offices are slow and time consuming, plus the use of gas to get to the post office. Large products/orders may require freight delivery. If your order reaches a certain size and/or weight you will not be given a shipping quote when you checkout. In these cases will we contact you the next business day with an estimated freight quote. Any shipments going to these areas, are subject us verifying the shipping cost before we send a product, at a miscalculated rate. Our website uses a fedex shipping module and although it calculates accurately These areas require extra steps on our end that they can be physically shipped as is without additional fees. Call us 1-844-663-0396 for accurate shipping cost. Sea of Green Website is managed separately from our brick and mortar stores. You may request to pick up the product instead of being shipped mark it in your notes or use the store as your shipping address, however we cannot reverse nor void shipping charges, nor adjust instore prices to match our website. Online prices are cheaper because of little overhead, and as convenience to the customers instead of driving to us, however with in store purchases you will have access to our knowledgeable staff and immediate warranty response, our in store prices reflects the service you will get with the purchase. Our online purchases are managed separately than in store purchases. We use www.authorize.net as a payment gateway for safe credit card processing. The company protects against fraudulent usage and protects our users privacy. Call 1-844-663-0396 to place your order with one of knowledgeable members of our staff. When ordering by mail, remember we only accept money orders.